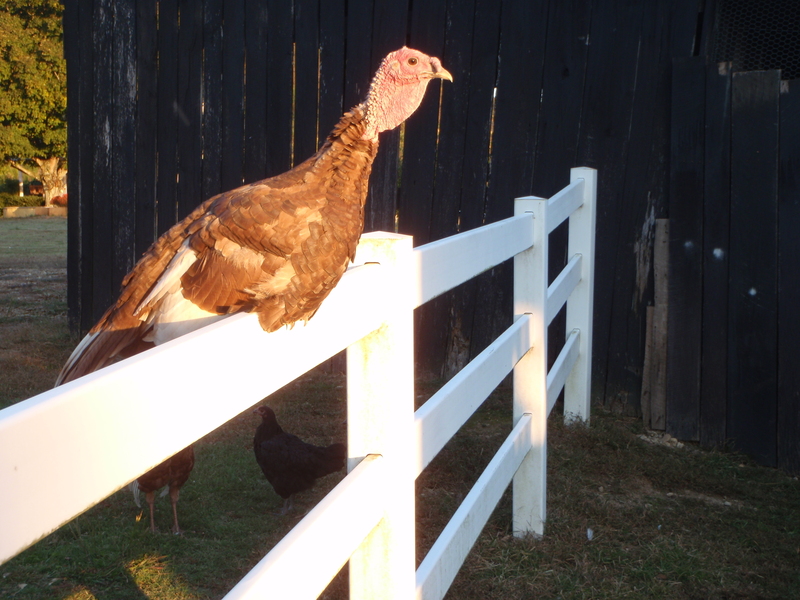 A Bourbon Red turkey relaxes on the fence enjoying the sunshine. Spring is almost here! That means that the turkeys are getting into the breeding mood and we should have lots of eggs soon from our small flock of heritage breed free-range turkeys. Our turkeys free-range around our farm chowing down on grasses, seeds, and insects. They fly very well and enjoy following us around as we do chores and take care of the other animals. Their favorite afternoons are spent swinging on our front porch swing. They truly are personable birds. T’his year we are raising Black Spanish, Bourbon Red, Chocolate, and Narragansett turkeys. Heritage breed turkeys were once common throughout the United States. They are the quintessential American bird. Unfortunately, with the rise of the factory-farmed industrial breeds like the Broad-Breasted Bronze and the Broad-Breasted White turkeys, the heritage breeds were almost lost. Now these older breeds are developing quite a following based on their superior flavor, their ability to free-range, and their ability to be raised sustainably because they can both forage for their own food and breed naturally. We need more people to help us preserve these heritage breeds that are so wonderful to raise and provide genetic diversity and safeguards to sustainable farmers. We need to create a market for the heritage turkeys so that farmers like us can continue to raise them and the breeds won’t disappear forever. How can you help save these breeds? By eating them! By eating heritage breed turkeys, you will ensure the breeds’ survival by encouraging small farmers to continue breeding and growing these wonderful birds. If we all keep going to the supermarket and buying Broad-Breasted White turkeys (which can’t find their own food, fly, or breed naturally), then that will be all people will be able to raise. The Broad-Breasted White turkey already has 95% or more of the American market. If this trend continues, then other breeds may go the way of the Dodo bird. That means less genetic diversity in our turkeys – one disease could wipe out great numbers of them. Heritage birds not only taste better, but they provide genetic insurance against disaster! From now until September 1st, Good Life Ranch is offering a special on a heritage breed free-range Thanksgiving turkey. For $75 you can order your own heritage breed bird to be the centerpiece of your Thanksgiving meal. This price includes free delivery to your door anywhere in Kentucky! For the average 14-lb bird, you can save $23 on the normal price of $7 per pound and the normal price does not include delivery. What a deal! To order, please contact us by emailing geoff@goodliferanch.com or calling 606.787.4217. We will then give you more information and answer any questions that you may have. We will confirm your order by requesting a $25 deposit to hold your bird, with the remaining $50 due upon delivery. Please don’t wait! We only anticipate raising 50 turkeys this year and they are sure to go fast!